February - the month of luuuuvvvvv. So what did comic fans love about February 2014? Well Marvel still held the spot of Publisher #1, over closest rivals DC by 6.24%. Image Comics retained third, despite the fact IDW's hardcover Locke and Key Vol6: Alpha and Omega bet them to their usual #1 spot on the highest selling graphic novels list. 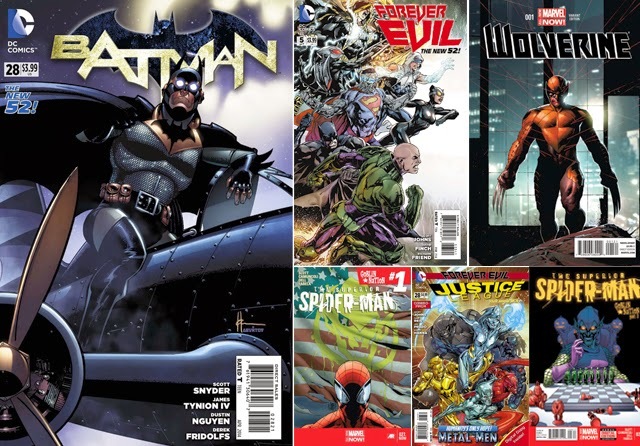 THE TOP 6 COMICS FOR FEBRUARY 2014: 1) BATMAN #28 2) Forever Evil #5 3) Wolverine #1 4) Superior Spider-Man #27.NOW 5) Justice League #28 6) Superior Spider-Man #28 - Full stats after the jump. MY THOUGHTS: It's easy to see how the outside world sees comics as 'Batman, Spider-Man and Wolverine' huh? Though the Metal Men gracing the cover of a Top 6 book may be a sign of the apocalypse in some cultures, it is a sign of a greater armageddon that the launch of writer James Robinson's Fantastic Four #1 came in at spot #7. Surely that magic pairing outranks a new Wolverine hyped to be where Logan dies in a few months time. THE LITTLE ENGINE THAT COULD: It's a repeat contender for this title, but Image Comics' The Walking Dead grabbed spots 8 (#121) and 9 (#122) in the larger Top 10 comic sellers list. Yes - both issues of a bi-monthly cracked the top slots. Give it a few months and there will be no doubt when it comes to the dead rising, who truly rises highest. TOP COMICS OF FEBRUARYS PAST: In 2002 the third issue of Frank Miller's Dark Knight Strikes Again held the top spot, while in February 2008, Wolverine heading a deadly new X-Force #1 held that honour. Then in the mania of President Obama's election, the man himself held the cover of Amazing Spider-Man #583 as #1 in 2009.